Home 3 Parallel Benefits of Cloud Computing & Social Media for Small Business! Social media, cloud computing, mobile computing, real-time Web, and real-time & local search are some of the core areas predicted to be game changers for small businesses. We are living in the world of Web 2.0, where hundreds of millions of people are connected to the Internet and millions of those people are connected on social networking sites like Facebook, LinkedIn, MySpace, and Twitter, using blogs, and posting on YouTube and Flickr. And there are thousands of examples where businesses have achieved milestones using these social networking tools. But now it’s a Even playing field for Small Businesses, they can utilize the same tools that Fortune 100 companies use on a fraction of cost. Saving up the energy, infrastructure, environment and management bills. Similarly social media helps in lowering the cost of small business marketing, promotion, customer service, playing a key role in start-ups’ success. Emma Jones, co-founder of StartUp Britain, said technology has enabled more people to keep costs down while starting up their own business. She noted some businesses do all their promotion via Facebook and rake in “thousands of pounds worth of sales”. “Free and low-cost social media has represented a great way of small businesses being able to promote themselves and make sales”. Small business cannot endure to work with highly paid consultants to setup their IT infrastructure and cannot even have cost to retain them for management. Cloud computing in contrast has allowed them to relieve the infrastructure management costs. Cloud computing companies provide 24/7 customer support to handle all the issues. Similarly, social media has given the small businesses an opportunity to manage all the aspects of marketing from one platform; there is no need of hiring specialized people to manage their campaign. It’s easy to setup and can be handled by a single person. Starting with introducing the business with friends and followers and engaging them accordingly can easily create a buzz. Blogging is the most effective way to attract the target audience and converting them into customers. Cloud computing is the biggest trend in business industry seen after the adoption of social media. Companies like Google and Amazon have adopted cloud computing. And they are also providing cloud computing/hosting services for the other companies. And due to its scalable, cost effective, easily handled nature, it is becoming a hot cake for bigger companies as well as smaller businesses. Similarly, social media is incubated heavily by the biggest companies and they harnessed it according to their needs. They spend millions of dollars each year to reach their audience/consumers socially, as they know that social behavior helps them understand what their customer really want, and that’s what helped them increasing their sales up to 50%. Smaller businesses have the same chance of reaching the right people, engaging them with right content and converting them to loyal customers. They have a chance to get their small business to an enterprise level business and mark their victory around the world. Muhammad Saad Khan is a Writer, SocialMedia & Content Marketing Philanthropist & Thought Leader. He is a Public Speaker & Social Activist to Fight #HumanTrafficking. Follow Him on Twitter, Google+, and on Facebook. Nice writeup…You have covered basic stuff and explained it well.. 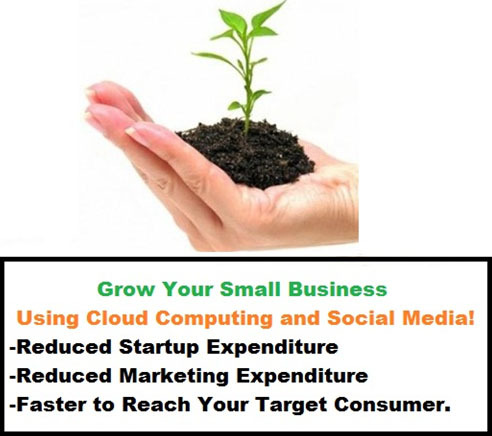 Thanks for the Compliment Sarvanshu – I have just tried to simply the basic advantages of using cloud computing services and social media marketing for small business owners. I mean these two things are like blessings for small business owners, home business owners, Entrepreneurs and Startups who are planning to go out for a search of their target audience online. As i have said in the context that – they are the same tool used by the Fortune 100 Companies, and now small business owners have the privilege to use them as well in a very very cost effective manner. Very well explained. And you are right, the playing field is being leveled with the use of cloud computing. Nice article and looking forward to more!